This letter of intent for an office lease deal is for a credit tenant and, as one might expect, is extremely pro-tenant in tone. It is designed to be presented to the office landlord by the tenant's broker. It goes through virtually every facet of the lease transaction and specifies pro-tenant provisions that are to be incorporated into the lease after the letter of intent is signed. Among other things, it give the tenant a renewal option at fair market rent, rights of first refusal on adjacent space, options for additional space, right to terminate the lease if the premises are not completed within a certain time period, moving expense reimbursement by the landlord, special cleaning obligations for the landlord at tenant move-in, right to repair and deduct from rent in favor of the tenant, etc. etc. Upon your acceptance of the proposed terms and conditions, Landlord shall prepare final lease documents for review. 1. Building: A ___ story office building containing approximately ______ rentable square feet. 3. Floors and Area of Premises: Floors: _____ containing approximately _____ rentable square feet. 4. Method of Measurement: Rentable area for Tenant’s premises and the Building shall be calculated according to the Building Owners and Managers Association International (“BOMA”) Standards for the measurement of commercial office space as specified in Standard Method for Measuring Floor Area in Office Buildings, ANSI/BOMA Z65.1-1996. In no event shall the load factor exceed seven percent (7%) for a full floor nor ten percent (10%) on a multi-tenant basis. 6. Storage Space: Tenant shall have the option until twelve (12) mouths after occupancy to lease up to ______ usable square feet of space with a finished ceiling height of nor less than eight feet (8’) in the Building for storage, at $___ per usable square foot per annum on a net basis. This space shall not be subject to any allowances, rental escalations and any pass through charges associated with the operation of the building. Prior to the commencement of the sixtieth (60) month lease and at no cost to the Tenant, Tenant shall be granted __________ (____) months early occupancy from the projected completion date of tenant improvements and Tenant’s occupancy in accordance to the terms and conditions described in Section C below. 2. Tenant’s Share of Operating Expenses and Real Property Taxes (Additional Rent): The lease will contain an escalation clause (rent adjustment) with Tenant being responsible for its pro rata share of any increases in operating expenses and real property taxes over a Base Year which shall be defined as calendar year 20__. (Operating expenses for the Base Year will be calculated as if the Building were ninety-five percent (95%) occupied with all tenants paying full rental. Real property taxes for the base year shall (i) be calculated as if the Building were fully assessed, (ii) shall include Tenant’s Improvements as described herein, and (iii) shall assume 100% completion of all tenant improvements in the Building. The basic operating costs (costs, charges and expenses) which properly should be included or excluded as to the computation of operating costs, in accordance with generally accepted accounting principles shall be specified in the Lease. 1. Term and Commencement Date: The term of this Lease shall be for sixty (60) months commencing upon the completion of Tenant’s premises being fully ready for occupancy by no later than _____________. In the event Tenant is unable to occupy the premises on ________________, then Tenant’s occupancy shall be delayed until _______________with lease commencement occurring ____________. 2. Early Occupancy. Prior to the lease commencement date, including any early occupancy, Tenant shall have access to the space for the purpose of constructing specialized tenant improvements, installation of furniture, fixtures, equipment, files and business records. Tenant shall cooperate with the Landlord in order not to delay the projected completion date of all tenant improvements. 3. Option To Renew: Tenant shall have the option to renew the lease for any and all space then under lease by Tenant in the Building, for one (1) additional term of five (5) years, upon first giving Landlord six (6) months prior written notice of its exercise of such option. The rental for the renewal term will be ninety-five percent (95%) of the then net effective “fair market value” rental rate as specified in the attached Exhibit “A.” The calculation of rent shall take into consideration a minimum tenant refurbishing allowance of _______________ Dollars ($___) per usable square foot. 4. Fair Market Rental Rate: The determination of the prevailing “fair market value” rental rate shall be based upon the attached Exhibit “A” for space of comparable age, size, quality and floor height in comparable office buildings in the ______ Area, which is leased to tenants of credit quality similar to Tenant. The fair market value rental rate shall be determined by arbitration if the parties are unable to agree to the terms and conditions. 5. First Right of Refusal: Tenant shall have the ongoing First Right to Refusal for any space that becomes available on the contiguous ______ (__th) floor. Landlord shall notify Tenant in writing of the proposed rent and allowances. Thereafter, Tenant shall have ten (10) business days in which to respond to Landlord’s proposed terms and conditions. Both parties shall negotiate in “good faith” in an attempt to reach agreement with all other terms and conditions of the lease applying to such space. If Landlord and Tenant are unable to agree within the 10-day business day time period, Landlord may lease the space to the other tenant at a rent and allowances no more favorable than those offered to Tenant. If such a lease to another tenant is not consummated within three (3) months after the period when Tenant and Landlord were not able to agree upon a rent and allowances, then Tenant’s First Right of Refusal shall be reinstated. 6. Options for Additional Space: In the event Tenant does not exercise its option for the hold space, which is defined as the remaining space on the _____ floor, such space then shall become option space. Tenant shall have the first right to add such option space to the existing premises. In the event Tenant requires additional space for expansion and such expansion takes place within the first twenty-four (24) months, Tenant shall lease such premises at the same terms and conditions, including the rent and turnkey improvements. In addition, Tenant shall have the option for ______ rental square feet on the _____ (___th) floor of the building. Tenant’s option for additional space shall remain in effect even though Tenant may, at its sole discretion, choose not to exercise any single option. Notwithstanding the above, should Tenant wish to expand to the _____ (___th) floor during the first twenty-four (24) months of the lease term, Tenant’s occupancy of said expansion space shall be at the same terms and conditions of the lease, including the rent and turnkey improvements. After the twenty-fourth (24th) month, Landlord and Tenant shall negotiate rent and allowances for such expansion space. The Lease term for all additional space shall end on the expiration date of the then current initial or renewal term of the lease. All additional space shall then be subject to terms for renewal (and renewal rent), as well as all other terms and conditions of the initial lease (where applicable). The payment of rental by Tenant shall not commence until the completion of leasehold improvements and occupancy of the additional space by the Tenant. 1. Leasehold Improvements: Landlord, at Landlord’s sole cost, shall build out Tenant’s leased premises on a turnkey basis in accordance with the space plan submitted to Landlord’s space planner and contractor, including any modifications described in a final plan to be submitted to Landlord no later than ________. Modifications to the _____ space plan shall include, but not be limited to one additional office, relocation of proposed partition wall, security system for no more than ____ entrances/exits, electrical and phone room. Tenant shall use its best efforts to keep modifications to a minimum. Landlord shall submit Building Standard Work Letter for Tenant’s review and approval which shall be attached as part of the Lease. Tenant, at Tenant’s sole cost, shall be responsible for installation of a ___ ton portable air conditioning unit, with Landlord providing electrical and plumbing for condensation. 2. Leasehold Improvements by Landlord: Landlord, at Landlord’s sole cost, shall construct tenant improvements with Landlord competitively bidding Tenant’s work. Tenant may specify the inclusion of specific subcontractors for special tenant improvements. 3. Landlord shall bid out the required leasehold improvements to three (3) reputable and highly qualified union and/or non-union contractors, each of which shall have a reputation for excellence, integrity and timeliness. Landlord shall solicit bids from each of the contractors after the final plans and specifications for the leasehold improvements based upon preliminary plans being prepared and submitted by Tenant. Such bids shall be subject to review and approval by Tenant. By no later than _____________, Tenant shall submit a final space plan describing design specifications and leasehold improvements. Landlord shall assume responsibility for ensuring that all construction work is of the highest quality, and in compliance with all codes, legal requirements and insurance requirements. 4. Substantial completion shall be deemed to mean the following: the leasehold improvements for Tenant’s premises have been completed pursuant to Tenant’s final plans and specifications (except for normal punch list items which can be completed within thirty (30) days after substantial completion), and Tenant can reasonably conduct its business. 1. Purpose of Use. Tenant shall use its premises for general office use and any other legally permitted uses compatible within comparable office buildings in the area in which the premises are located. 2. Financial Information. Tenant has submitted most recent available annual financial statement. 3. Right to Assign and Sublease: Tenant shall have the right at any time, and from time to time, to transfer its lease without Landlord’s consent to any entity which is an affiliate of Tenant, who shall be deemed to mean any entity which owns or controls Tenant or which is owned or controlled, directly or indirectly by Tenant, or which merges with, acquires, or is acquired by Tenant. Tenant shall have the right at any time, with Landlord’s consent, which shall not be unreasonably withheld, to assign the lease or to sublease or otherwise permit occupancy of all or any portion of Tenant’s premises to third parties. Any and all profits realized from such subletting or assignment shall be retained by Tenant. Landlord shall have no right to recapture subleased space. 4. Landlord’s Compliance with Laws. Landlord, at Landlord’s sole cost and expense, and without being passed through as part of the operating expenses, warrants, that on the commencement date of this Lease, the Premises (including all parking lots, common areas, elevators and entrances serving the Premises) will comply with all applicable laws, ordinances, rules, and regulations of governmental authorities, including but not limited to, the Americans with Disabilities Act (the “ADA”) and all regulations and orders promulgated pursuant to the ADA (collectively, “Applicable Laws”). During the term of the Lease, Landlord shall comply with all Applicable Laws regarding the Premises, Building, parking lots, common areas, elevators and entrances serving the Premises, except to the extent Tenant must comply under subsection 5 below. 5. Tenant’s Compliance with Laws. Tenant shall comply with all Applicable Laws: (i) regarding the physical condition of the Premises; and (ii) that do not relate to the physical condition of the Premises but relate to the lawful use of the Premises and which only the occupant can comply, such as laws governing employment of disabled persons and provisions of auxiliary aids under the ADA, maximum occupancy, workplace smoking, and illegal business operations, such as gambling. 6. Indemnity. Landlord agrees to indemnify, defend and hold Tenant harmless from and against any claims, losses or causes of action arising out of Landlord’s failure to comply with any Applicable Laws as required by subsection a., above. Tenant agrees to indemnify, defend and hold Landlord harmless from and against any claims, losses or causes of action arising out of Tenant’s failure to comply with any Applicable Laws as required by subsection 4, above. 7. Identity. Tenant, at Landlord’s expense, shall require appropriate suite signage on the wall next to all entrance doors to space under lease by Tenant. All base building improvements, parking facilities, common areas, building systems and services to be furnished by Landlord pursuant to the terms and conditions of the lease shall be completed and in good working order as of the date Landlord or Tenant obtains a Certificate of Occupancy, permanent or temporary, for Tenant’s premises. 8. Right to Cancel. 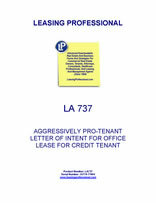 Tenant shall have the right to cancel the lease, if Tenant’s premises are not or cannot be completed in accordance with Tenant’s plans and specifications within ninety (90) days after the date Landlord and Tenant have mutually agreed upon for the completion of Tenant’s required tenant improvements and Tenant’s occupancy of the premises for the purpose of conducting business, excepting only delays resulting from force majeure or delays solely caused by Tenant. In addition to the above, Landlord shall reimburse Tenant for any costs relating to: “holdover” tenancy at Tenant’s present location that shall include but not be limited to base rent, expense pass throughs and parking charges, expenses or penalties incurred by Tenant as a result of a delayed occupancy of Tenant’s premises beyond ______ , whether or not such delay is otherwise excused hereunder.